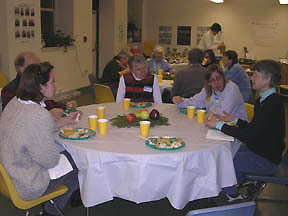 Twelve members of Friends of Fresh Pond Reservation attended the 2006-7 Winter Meeting, preceded by a fine potluck supper. Elizabeth Wylde opened the meeting by presenting the 2006 yearbook to the group and distributing copies of the Year in Review report. After inviting participants to share some of their recollections from the year's events, Elizabeth gave brief descriptions of the FFPR programs that were inspired by suggestions offered during the 2006 winter and summer meetings (see MINUTES). 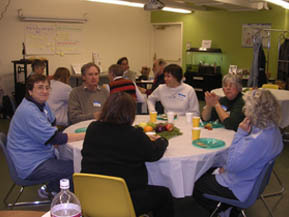 Barbara Strell presented the book created by participants in the 2006 Ecology Project, a group that met monthly to record seasonal changes in three habitats on the Reservation. The group discussion consisted of two parts: ideas for the coming year, and thoughts about how the group needs to change in the future. Many interesting suggestions were offered for future programs, and are listed in the minutes. The discussion about how to transition into the future centered around the eventual need for new leadership, the belief that the group needs new ideas in order to attract new participants, and the need to distribute the numerous tasks of running the organization among a larger number of people. Seven people, including Elizabeth and Jean, volunteered to form a Planning Committee to strategize these changes. The first meeting of the committee will be held on Monday, February 5 at 3:30 pm in the Maynard Ecology Center, Neville Place Assisted Living Facility, 650 Concord Avenue, Cambridge. All FFPR members are invited to join this committee. Please email Elizabeth at friendsoffreshpond@yahoo.com if you would like to participate.